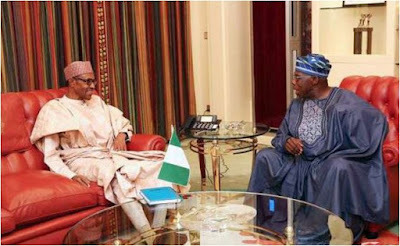 Amidst the tension that the ailing Nigeria’s President, Muhammadu Buhari may return to the country soon after over 80 days abroad, it has however been confirmed that the Former President Olusegun Obasanjo visited Buhari at the Abuja House in London. According to report from Tribune Online, ex-President Obasanjo had a warm greeting with President Buhari before both went in for a closed-door meeting that lasted 40 minutes. Furthermore, it was revealed that Obasanjo was accompanied to London by former Governor of Osun state, Prince Olagunsoye Oyinlola, who however didn’t not partake in the closed-door meeting. It can be adduced from the Saturday trip that got known today that the President is doing fine with his health and may even return to Nigeria sooner than expected. “Buhari, who was said to have expressed gratitude for the visit, also told Oyinlola that: “Excellency, you are looking really fine” with both Obasanjo and Oyinlola reportedly replying that they were happy to see that he (Buhari) was looking fine too”, report from the leaders’ meeting in London stated. Meanwhile, no picture and more details about the said trip have been revealed.